Gardening can be a therapeutic activity for many people , including seniors, people with disabilities, and caregivers. In partnership with George Pearson Centre, Farmers on 57th specializes in gardening and building communities with residents living with disabilities. 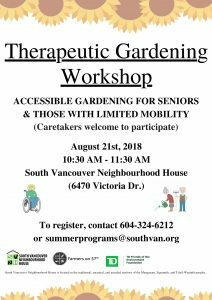 Sarah from Farmers on 57th will introduce us to the benefits of therapeutic gardening, and how to make gardening accessible for those with limited mobility. disabilities, therapeutic gardening, workshop. Bookmark.